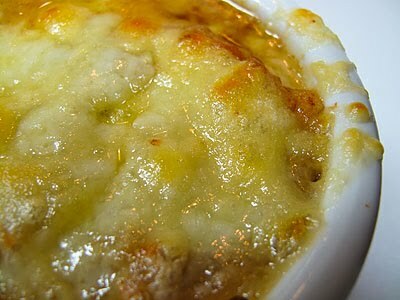 Who, and especially those, ahem, in the boomer age-group, doesn't dream of a delicious, steamy, cheesy Onion Soup Gratinée. The last couple of colder-than-we-have-been-enjoying nights made me think of making it, but to make it in a kosher kitchen, I would have to make the choice between delicious soup and delicious cheese. Having tried a topping of vegetarian "cheese" on a classic beef-stock-based onion soup, well, let's just say I no longer even pause at a display of those products. So, the question remained, how to "beef up" the soup, this reminded me of a wonderful NPR program I had downloaded to my ipod-The Fifth Taste that discussed what the Japanese call "umami" (it means YUMMY). So I googled Miso Onion Soup, and found the following recipe. It is very very good as it stands- but its wonderful with my alterations: instead of using all "spanish onions" (those are the basic, yellow, any-market onions) I used a variety of different onions, including red ones, a sweet one, and most important, three or four shallots. And while the original recipe called for swiss cheese- definitely try Gruyère, or a mix of Gruyère and Fontina. As Julia would say: Bon Appétit! 8 diagonal slices of baguette, about 1/4 inch thick. 1. Preheat oven to 325 degrees. Place a large sauté pan over medium-high heat for 1 minute. Add 1/4 cup olive oil, and heat until shimmering. Add the onions and cook, stirring constantly and adjusting heat as needed, until the onions are soft and deep golden brown, about 20 to 25 minutes. Remove pan from heat and allow onions to cool in the pan. 2. Brush both sides of the bread slices with the remaining 1 tablespoon olive oil and place on a baking sheet. Bake, turning once, until just crisp, about 4 minutes a side. Remove from oven and set aside. 3. Pour 3 cups of water into a 2 quart saucepan. Cover and bring to a boil. Add miso, thyme, and cooked onions; mix well. Simmer and season with salt and pepper as needed. 4. Preheat a broiler. Place a large oven-proof serving bowl or four small oven-proof bowls on a broiling pan or small baking sheet. Pour the hot soup into the large bowl or divide among the small bowls. Place the croutons on top of the soup, and top with Swiss cheese slices. Place the pan holding the soup directly under the broiler until the cheese is melted, and the soup is bubbling. Serve immediately.